SOROTEC Outdoor Intelligent High Frequency Online UPS provide continuous pure sine wave AC power supply foroutside communications / network equipment. outside communications / network equipment. 2.Double-conversion online design, high temperature resistant, anti-cold, sealing level for IP55; With the wide range of input voltage and frequency of input window (- 45% +35% rated voltage and ± 10% rated frequency), in many remote areas of China after a severe test of the grid. 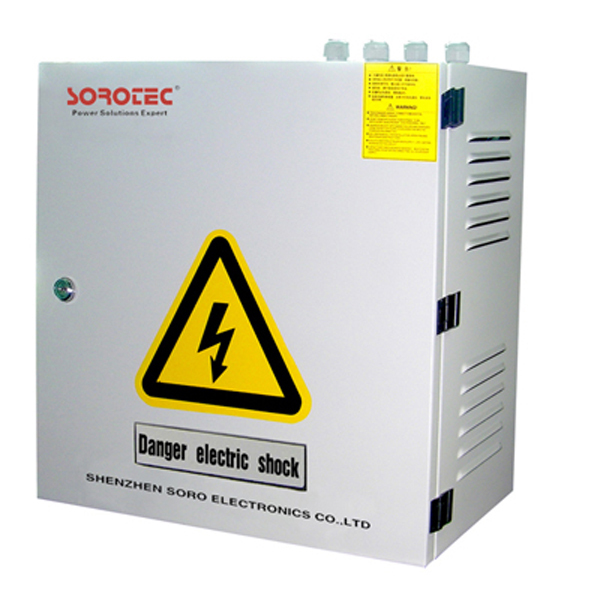 This UPS is commonly used in the corner of the city, remote roads, mountains, bad environment, such as high temperature (+50 °C) / low temperature (-40 °C), severe dust, moisture, rain, mist erosion, very poor power quality (voltage longterm higher than 260V or less than 160V, frequency abnormal change) in the area. 1.Using microprocessor control, directly produce highfrequency pulse width modulation wave (SPWM) control of the UPS inverter, to simplify the UPS control circuit, to improve the stability, to have more real-time UPS to quickly respond to changes in the external environment and guarantee the machine’s control circuit is more simple and reliable. 2.Using digital control techniques, to avoid the traditional analog control temperature drift inherent defects such as hardware parameters, to ensure consistency and reliability of UPS. Overload Capability Overload（110%~150%)for 30 seconds,then automatically transfer to bypass.when load is normal,it can automatically transfer to normal mode. Controlled by microprocessor, directly produce high-frequency pulse width modulation wave (SPWM) to control for UPS inverters, simplifying the control circuit of ups outdoor, to improve the stability of the outdoor ups systems; ups outdoor has better real-time, to respond quickly to changes in the external environment, and to ensure that the whole control circuit is more simple and reliable. The digital control technology is adopted to avoid the defects of hardware parameters such as temperature drift, which is inherent in the traditional analog control, so as to ensure the consistency and reliability of the outdoor ups systems. The display panel provides users with the working environment and working status of the ups outdoor. And through the combination of display, can quickly determine the fault causes of UPS and fault location, so that the maintenance of ups outdoor is more convenient and fast. Through the RS232 interface with the UPS intelligent monitoring software can communicate with the computer, all kinds of outdoor ups systems parameters at a glance display on the communication interface, through the settings, the computer can be a variety of UPS function of direct control. Selection of SNMP adapter, UPS with remote network management capabilities, providing real-time ups outdoor information and power information, through a variety of network operating system for communication, management.